A new study from Techaisle shows SMB cloud success is growing for small and medium size businesses, and it’s just the beginning as cloud computing adoption rates continue rising. “You don’t have to spend much time around cloud computing before you run into arguments regarding cloud economics and you will undoubtedly encounter the phrase “Capex vs. Opex.” This refers to the fact that stocking your own data center requires capital expenditure, while using an external cloud service that offers pay-as-you-go service falls into ongoing operating expenditures: thus the contrast of “Capex vs. Opex.” The next go-round of the argument then devolves into a tussle about which alternative is cheaper.” – Bernard Golden at CIO. The principal motives for adopting cloud computing and the resultant advantages achieved varied by size of respondents. 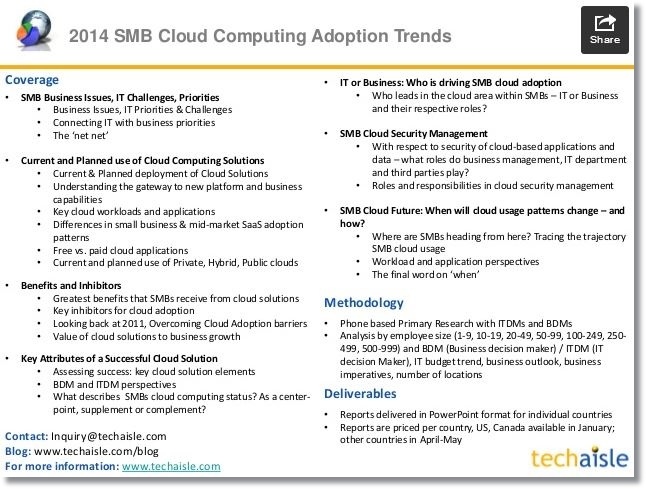 SMBs’ reluctance about cloud computing also differ. For instance, small businesses (1-99 employees) focus acutely on business advantages: Increased business dexterity is the most cited cloud benefit, trailed by attaining proficiency that would have been cost/time/motion prohibitive, reducing business process-connected expenditures, and increasing worker efficiency. Mid-market businesses (100-999 employees) also enjoy these upshots – but the top-ranked advantage of cloud computing is IT-related, with “make our IT staff more productive” cited as a compelling cloud benefit by over 57% of mid-size businesses. This is a marked sea-change from the previous years, when SMBs moved to cloud adoption mainly as a way to reduce IT costs. IT-related expenditures are still motivating SMBs toward cloud computing, especially in the instance of smaller businesses that have moved their applications to the cloud for the prospect of acquiring technologies and software applications that might otherwise have been too expensive or require increased IT staffing, however, reduced costs are no longer the primary motive for SMBs turning to cloud computing. This changing emphasis of cloud adoption is a “perfect storm” that balances technologies that are important to SMB cloud success. Applications in social media, business intelligence and mobile are increasingly driven by solutions that function primarily in a cloud modality. By utilizing the cloud, IT staff does not squander limited resources on tasks like managing software licenses or updating office computers with new applications. Another cloud advantage for IT staff is that everyone across the business will be utilizing identical software versions, so no longer are typically inherent frustrations caused by pell-mell mixing and matching out-of-date applications. 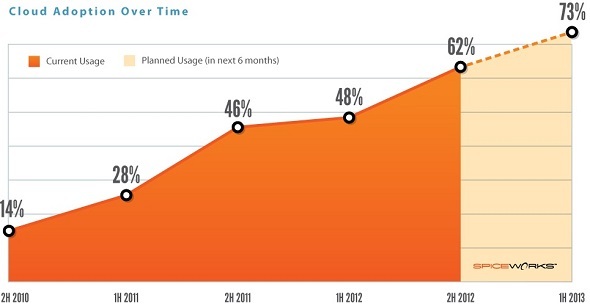 Additionally, IT can rely on the consistency of managed cloud-hosted applications and operations. With monthly expenses and a service provider agreement that delineates precisely what services are included, the IT department and its budget are free to concentrate on new projects and priorities that help expand the overall business plan without the added cost and hassle of installing new hardware and software to mitigate increased data loads. Security concerns have been the principal worries slowing cloud adoption and are a primary objection why an SMB may delay making the move. IT departments are typically the default security staff, despite that they are typically not sufficiently trained in Internet security. Resultantly, as cloud computing increasingly goes main-stream and security tools become more sophisticated, IT departments find that adoption of the cloud into their business environment actually increases the overall cyber-security. 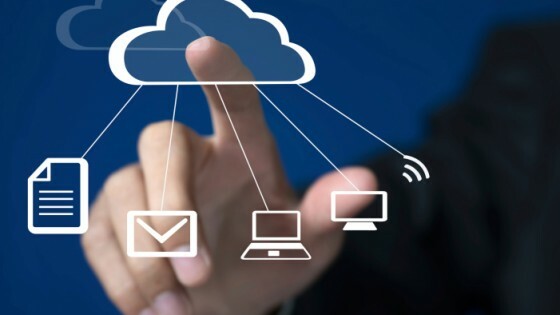 Respondents in the research valued how cloud computing has improved their business agility. 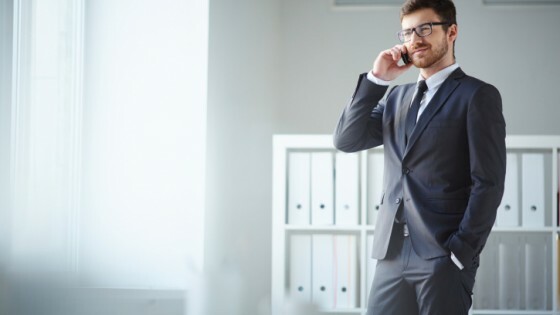 The ability to acclimate rapidly to changes in technologies and the marketplace, to reach a wider base of customers and to incorporate mobile and other remote-computing processes has leveled the playing field between SMBs and larger enterprises.